When managers coach direct reports, organizations benefit. No wonder many companies include coaching as a key leadership competency. Through coaching — a.k.a. collaborative development discussions — with their managers, direct reports can learn and grow in key ways. Coaching can help people gain greater self-awareness, increase their autonomy, reinforce strengths and skills, and take more responsibility for their own development and career path. Direct reports will also be more likely to agree with and implement their individual development plans and be more engaged in their work. Unfortunately, not enough managers are taught how to coach. Coaching can be informal or formal. In either case, a good coaching outcome begins with a good coaching relationship. A coaching relationship needs both boundaries and trust. To build relationships with your direct reports, it’s important to know them well. You’ll want to talk through your role as a coach, show genuine interest in their development and follow through on promises. Of course, working on the relationship is an ongoing process. It’s also just one element of effective coaching. 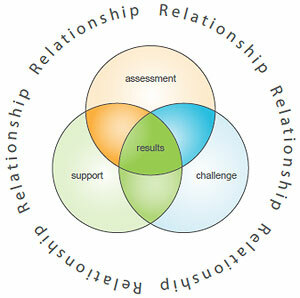 CCL’s RACSR coaching model includes Relationship, Assessment, Challenge, Support and Results. You can learn more about CCL’s RACSR coaching model and how to put it to use with your direct reports and members of your team in a brief CCL guidebook, Becoming a Leader-Coach: A Step-by-Step Guide to Developing Your People. What job challenges are you facing that I need to know more about? Are you getting the right amount of attention from me? Do I listen well enough?